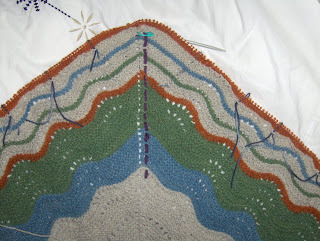 Half-way through the stripe sequence on my Hap-like shawl. I now repeat these stripes in mirror image all the while getting increasingly concerned about whether or not I'll have enough of the Oatmeal yarn for the sideways edging. It's a strangely short leap from ecstasy to despair. In the meantime I am still loving this beautiful variation on the Shetland Hap shawl and thinking it's going to be one of the loveliest, snuggliest things I've ever knitted. come on! You are not near despair! 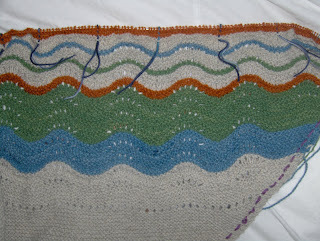 Shawl is progressing great! It'll be keeper!